What is your novel Mr. 8 about and how did you come to write it? 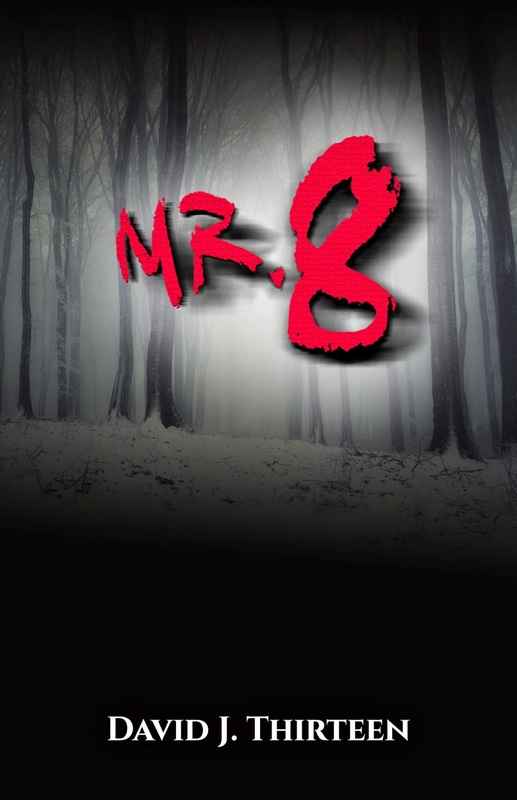 Mr. 8 is about a college professor in a small town who gets pulled into an investigation of a series of murders. Just before the victims died, they each had started to draw the number eight everywhere they could, so the murderer has been dubbed “Mr. 8.” As the investigation progresses, it begins to appear that the killing might be only the first sign of a strain of madness spreading across the town. This book came almost completely from a dream. It was a particularly strange, complex and horrific dream that stuck with me. At the time, I was immersed in two other writing projects but the story wouldn’t leave me. I decided to make it a small side project and put it up as a serialized novel on Wattpad. I figured one short chapter a week could be done without impacting my other work. But it soon grew and became my main project. Booktrope is a revolutionary publishing model. Tell us a little about the process from the author's perspective, from submitting your manuscript through to the production of it? I was extremely lucky with Booktrope. As I was nearing the end of Mr. 8, I was approached by a senior member of their team who was surveying Wattpad for publishable works. Having his recommendation made the submission process extremely smooth. I was attracted to them because of their quick to market approach. I knew that if I went with them, my book would be edited and in print in a matter of months, unlike a more traditional route that could take years. Booktrope is a young company and has a very lean operation, with some great people working for them. They are very hands off, or as another author who published with them said to me, “Don’t expect any handholding.” They want writers with initiative and the drive to get their book published. Once I was signed on, they gave me access to their project website. This was where nearly all the interaction takes place. I had a project page that tracked each step of the process. There were also discussion forums, lots of literature on publishing and a directory of the other Booktrope members. The first thing I needed to do was build my team. Instead of them having editors and designers on staff, Booktrope works with a team model, where all these professionals are freelance and will work on a project not for salary but for a percentage of future sales. I put the project team together researching members I felt would be a good match. This would lead to an online discussion that could take an afternoon or several weeks before we’d decide to work together. The great thing about Booktrope letting me be so independent was how much control I had. And that was also the hardest part. There were days (especially at the beginning) where I wondered if they were out of their mind for putting so much into the hands of someone with so little experience. But little by little it came together as the book stepped through the process, so it looks like they knew what they were doing after all. How did you find collaborating with your team - editor, proofreader, designer and marketer? Working with the team was a great experience. My only regret was we never got to meet face to face. I was working with people from around the country and around the world—my marketer is from Belgium. So an actual meeting was out of the question. Working with my editor, Gerald Braude, was the most educational. I learned so much by seeing the elements he picked out for rewriting. I think if there is any one thing from the whole experience that I’d want to pass along to other writers, it is that getting an editor to go over your work is invaluable. A good one has the power to point out the mistakes you never knew you were making. Working with the designer, Donald Cronkhite, was the most fun. He’s a graphic designer and an artist. Once I checked out his portfolio, I knew I wanted to work with him. I loved the way he took images from nature and turned them into bold, dramatic pieces. The cover is the only real visual element to a book, so it was very gratifying to see how the things that came up in brainstorming came together as a finished composition. I’m currently working on The Things We Bury. It’s a short series centered around a government research lab for captured supernatural species. It’s a lot more science-fiction than Mr. 8, but it mashes in elements of horror, mystery, and a few other genres. I’m currently posting the beta version on Wattpad and book one should be completed in the spring.